In addition to incredible views, the Amstel offers further delights. These include rowing on a quiet Sunday morning, a pleasant riverside jog, or simply daydreaming by the water. Living here means happiness every minute of the day. Right at the door of HAUT is the marina, a new Amstel hotspot. The famous Amsterdam canals are less than 5 minutes’ boat ride away. 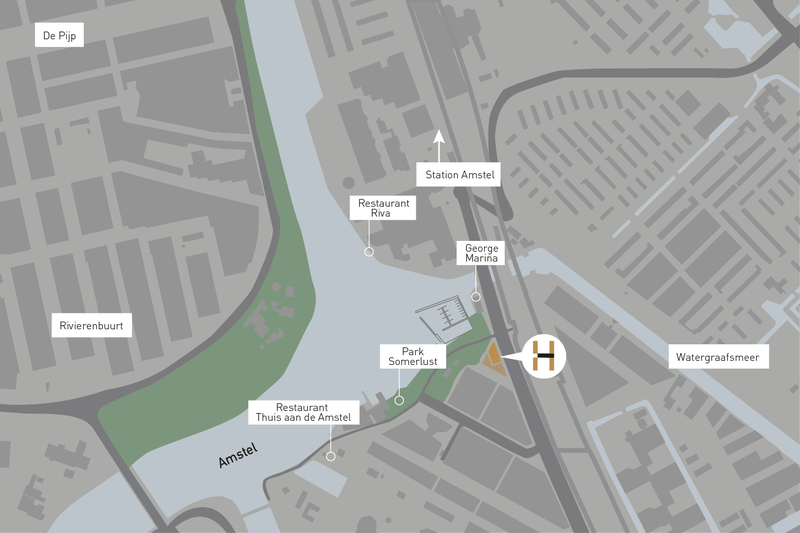 HAUT offers the best of both worlds; life by the Amstel and Somerlust park, and proximity to the city centre. Shopping can be done on the original Amsterdam-style, Rijnstraat. HAUT’s neighborhood offers fantastic restaurants and cafés such as Riva, Rijssel and Thuis aan de Amstel. Amsterdam city center is also within cycling distance.